If you are a woman, and you speak out about anything online, you will be on the receiving end of, at best, sexist remarks, or at worst, targeted harassment, abuse and threats. A number of weeks ago I was contact by a company who were doing some filming for 38 degrees. They were looking for people who'd had good experiences of the NHS for a Save Our NHS campaign. I said yes! They came to my house, filmed me, and the video went online a week ago. I've mentioned previously that I was nervous about it as I've never done anything like it before, but actually the response has been FANTASTIC. The video has had over 350,000 views! Well over 10,000 people shared it online. And I've been busy online since, sharing the link, responding to messages, engaging in conversation and debate. Much of it is constructive and friendly, but some of it... not so much. I don't think this needs any commentary. 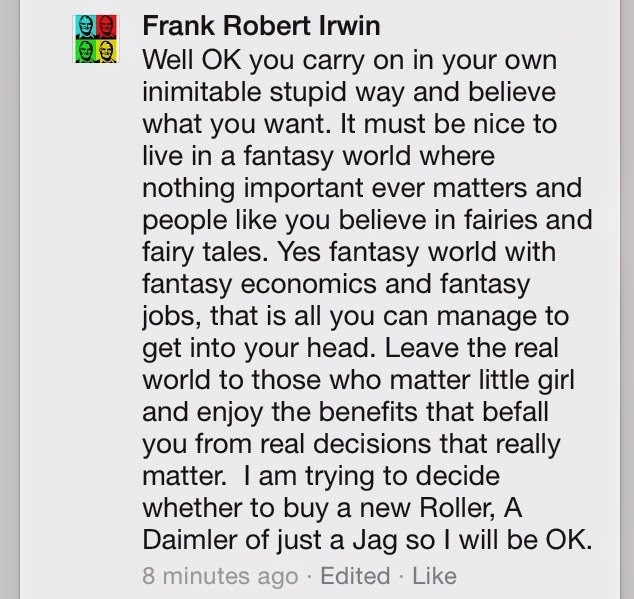 Just have a look at the comments I have been receiving from Frank on the 38 degrees Facebook page. 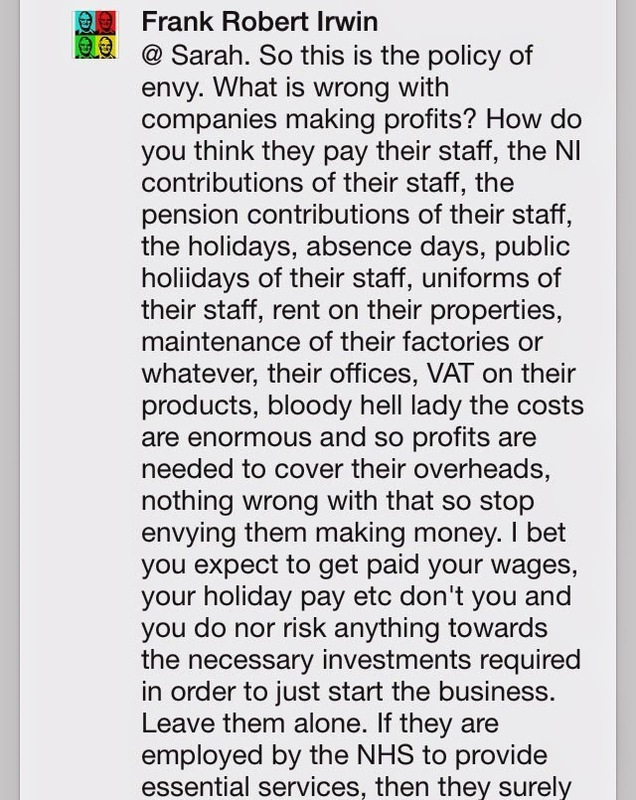 This is in response to me not wanting the NHS privatised. Sexist much? 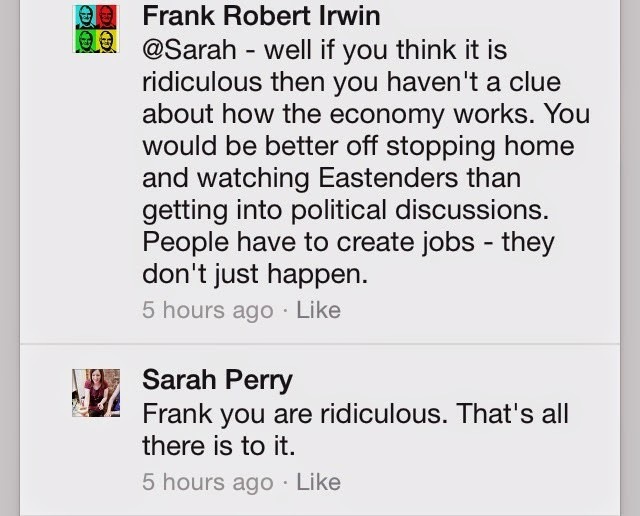 Clearly Frank is a sexist idiot. I'll just leave him to it. When the video was put online, one of my friends tweeted it to Kate Godfrey who is parliamentary candidate for Labour in Stafford - where £1.2bn privatisation of cancer and end of life care is planned to take place. Kate really liked the video! She has been sharing it lots, and a couple of days ago I spoke to her on the phone about the NHS, privatisation of cancer care, and about the impacts of breast cancer. Last night I went and had a look on her Twitter page to see if she'd shared the video again and I saw that she was being persistently hassled by another Twitter user because she had blocked people who were trolling her - this included messages that were obscene and threatening. She was repeatedly having to defend her right to block accounts that were abusive towards her and was being told that by doing so she was into "victim politics." I then searched for tweets sent to Kate and immediately spotted a troll account that has clearly been set up purely to harass her. This all makes me furious. I am sick of seeing women being harassed and threatened online simply for being women. I've been on the receiving end of a lot of abuse for supporting the No More Page 3 campaign. Some of it is childish, some of it is threatening. But sadly, if you are a woman who is going to speak out about sexual objectification you quickly come to expect that. 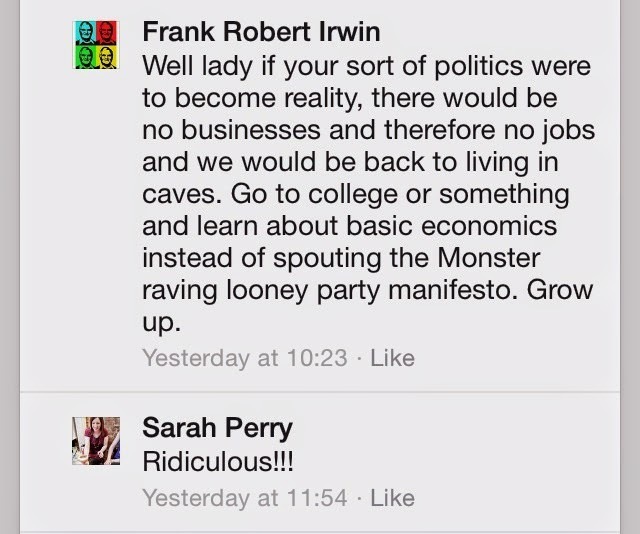 I guess I just wasn't expecting the same harassment to be in my face when discussing cancer care and the NHS. I should have expected it though.... because it really is true. If you are a woman, and you have a voice online or in the public arena, you'll be harassed, threatened and abused no matter what it is you're taking about, just for being a woman. Oh look, all comments gone. Because my blog isn't for wasting time on people who want to criticise while remaining anonymous. Ie it's not for cowards. 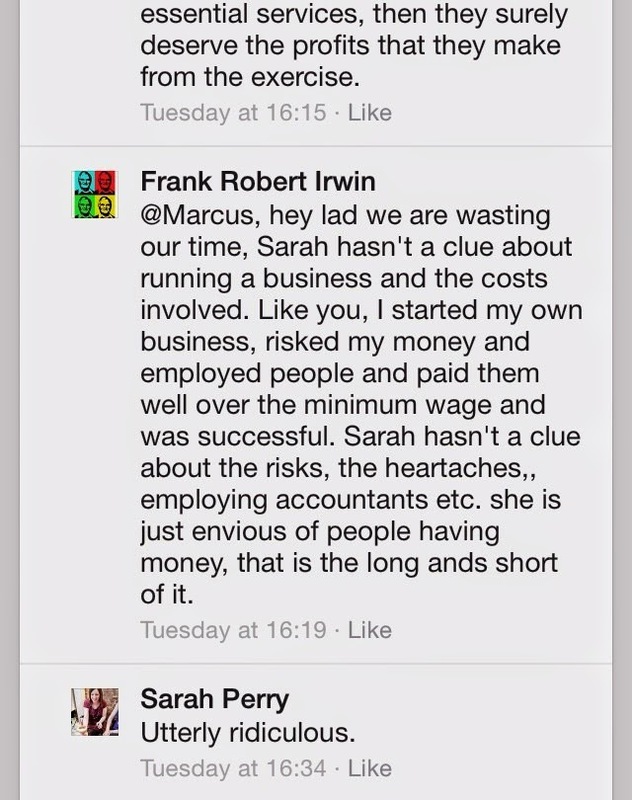 In Franks messages above he wasn't sexist, at least not in the screen shots. He was debating privatisation. Unless you think that arguing with women is sexist, in which case it's all over those shots. But if this is the case then you're backing sexism ironically. Since you don't like anonymous critisism my name is Seb.